Las Vegas, NV (January 7, 2015) – InHand Electronics, a leading original design manufacturer (ODM) of low-power embedded systems, Internet of Things, and rugged device designs for original equipment manufacturers (OEMs) joins Freescale’s Internet of Tomorrow tour at the Consumer Electronics Show in Las Vegas this week with a demo of their Hydra-F6 rugged tablet. The high-end tractor trailer, retrofitted to display over 120 products and technology demonstrations, began traveling around the country last October offering consumers a hands-on experience with Freescale-powered, next generation Internet of Things devices. The tour is meant to “help spark new ideas and bring the building blocks of IoT directly to the creative minds and companies that are making the IoT a reality,” according to Freescale. On the tour, InHand’s tablet is wirelessly connected to the SteadyServ® iKeg® in the kitchen area of the bus. 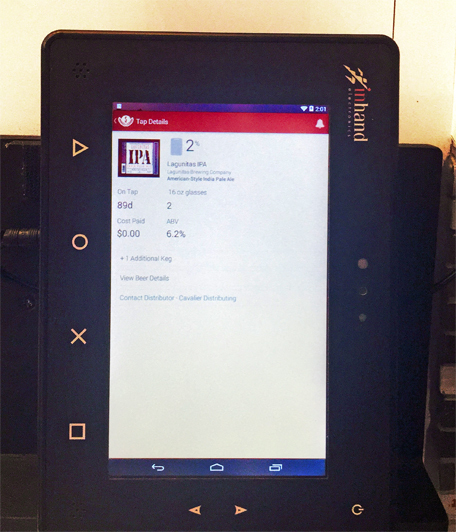 The tablet displays real-time information about the iKeg’s beer supply using the SteadyServ application. The Hydra-F6, which is fully customizable, was built to be waterproof and MIL-STD-810G rugged, able to withstand a variety of conditions that would render commercial tablets useless. The tour will showcase the tablet’s wide-range of uses and additional InHand products will be added to other sections of the bus, including a circuit level demo in the Innovation space. The IoT tour will continue throughout the country through 2015, covering over 20,000 miles. InHand’s products will remain on tour and interact with other devices within the Internet of Tomorrow. For location dates and more information on the Freescale Internet of Tomorrow tour, visit: http://iot.freescale.com/. InHand Electronics, Inc. is an original design manufacturer of single board computers and rugged handhelds for original equipment manufacturers. InHand’s products are used in a variety of markets including: military, healthcare, Internet of Things, industrial, entertainment, and instrumentation. Products feature industry-leading technologies such as: Freescale, Intel, Texas Instruments, and Marvell processors and Android, Linux, Ubuntu, and Microsoft operating systems. InHand offers engineering design services (system, hardware, software, and packaging) along with support services (product manufacturing, program management, manufacturing test development, and supply chain) to assure on-time and on-quality product delivery. InHand offers commercial off-the-shelf (COTS) computing platforms, as well as modified COTS design services to customize electronic product solutions. InHand is an ITAR registered company. InHand products are designed and assembled in the USA. The company’s headquarters are located along the I-270 Technology Corridor in Rockville, Maryland.For more information, visit www.inhand.com. Freescale Semiconductor (NYSE: FSL) is a global leader in embedded processing solutions, providing industry leading products that are advancing the automotive, consumer, industrial and networking markets. From microprocessors and microcontrollers to sensors, analog integrated circuits and connectivity – our technologies are the foundation for the innovations that make our world greener, safer, healthier and more connected. Some of our key applications and end-markets include automotive safety, hybrid and all-electric vehicles, next generation wireless infrastructure, smart energy management, portable medical devices, consumer appliances and smart mobile devices. The company is based in Austin, Texas, and has design, research and development, manufacturing and sales operations around the world. – See more at: www.freescale.com.